​custom and personalized paper goods and gift items. If you're planning a 1920's theme party why not go all the way and make it a Speakeasy party? Speakeasies, though illegal, were popular drinking establishments during the Prohibition era in the United States during the twenties and early thirties making this t the perfect theme for a roaring 20's Great Gatsby style cocktail party. You can learn more about Speakeasies HERE. You can decorate for the event with old-fashioned decor and have all the guys and dolls dress the part. There are Speakeasy invites for many different special occasions, like milestone birthdays, Bachelorette parties, and even New Year's Eve. We've selected four of our favorite designs but there's lots more where these came from. You can see them all and some other fun Speakeasy party supplies by visiting Speakeasy Party at Zazzle. ​Each of our featured invites measure a big 5" x 7" and come with a white envelope. You can order as many or as few of these great personalized invitations as you need. Zazzle also allows you to customize your invites for card stock, size and shape. Each invitation design was created by an individual artist who keeps shop at Zazzle so prices will vary. You can find all kinds of great and affordable Speakeasy decorations for your theme party at Amazon. In honor of the upcoming Downton Abbey movie, YES, it's finally been confirmed, I've decided to share some very chic 1920's style birthday party invitations. These black and white beauties are super stylish and SCREAM 1920's fun while being super chic and elegant. It says 21st birthday, which is an awesome time to throw a 20's party, but each of the invites featured on this page can be customized for any birthday milestone. Tell it like it is with this GREAT Gatsby inspired birthday invite featuring a red-lipstick-wearing lady with a timely fashion piece on her head. The lead in invites your friends and family to join you for an evening of Jazz and Booze! This fun Downton Abbey inspired birthday invitation features a gorgeous vintage car from the twenties era and works well for both guys and dolls who are celebrating another year of life on this planet. All of the invites can be ordered in the exact number that you need with bulk discounts for large orders starting at 25. They each come with a white envelope and Zazzle's 100% satisfaction guarantee. See more 1920's theme party invites. Theme parties make any occasion so much more fun! Don't you agree? If the birthday girl loves fashion, I bet she'll go bananas for a 1920's Great Gatsby Art Deco Sweet Sixteen party. Click on your favorite invites to learn more about each one. To help you out with ideas and, of course, THE BEST invites for this grand occasion, I've searched through the collections at Zazzle to find some super personalized invites that are the cat's pajamas. The first one I've featured here has an adorable Flapper girl wearing traditional 1920's garb, and strings of pearls. It's got gorgeous gold art deco designs in the corners and throughout the party information. Take my word for it, fashionista girls LOVE dressing like flappers. I mean, who wouldn't? Cute fringe covered dresses and headbands are all it takes to make this vintage look come alive. My next selection for a SWEET sweet 16 party invite is an art deco stunner! Done up in the finest colors of black and gold, this one is sure to please the little lady who loves the unique 1920's look. The flip side is just as pretty and contains all of the personalized 16th birthday party information. And here's another Deco beauty for her Sweet 16. This one features pink designs and vintage lettering on a pitch black background. It's a chic selection for the young lady who loves pink. This design and similar others are also available in a rainbow of other colors. You can see them all here. If you need ideas for your roaring twenties sweet sixteen party, I suggest you take a little trip back in time by exploring all of the really great ideas available at Pinterest! You'll find everything from decorations to clothing ideas and more. Start HERE! If you need to find affordable outfits and clothing ideas, I found some really cute dresses, headbands and even some things for the guys to wear at Amazon. Take a look HERE. Each of the invites your order comes with a standard white envelope and a 100% satisfaction guarantee from the manufacturer. Best of all, you can buy as many or as few as you need! This golden Calla Lily 1920 Art Deco wedding invitation is truly stunning. This gorgeous, dazzling, chic invite brings back all of the glamour and glitz of the 1920's Art Deco era. A single golden Calla Lily flower sits on a pitch black background with all of your personalized wedding information printed in fancy gold-colored ink on the side of this unique 5" x 7" invitation. If you're planning a modern vintage or Gatsy-inspired wedding, this romantic design would be the perfect way to invite friends and family to come help you celebrate the happy occasion. You might also enjoy taking a look at our hand-picked favorite retro and vintage wedding invitations HERE. Today's top retro invite pick is a glamorous Art Deco Peacock birthday party invitation that's so perfect for her. If she loves the Old Hollywood glam style, you won't go wrong in choosing to invite friends and family to her birthday shindig using these gorgeous 5" x 7" invitations! This stunning invite design is a wonderful mix of old-world charm and modern chic. It features a trendy peacock with a big, bold, beautiful set of feathers spread out all over the front of the card. There's a glittering gold border surrounding a black box that contains all of your personalized party information. They can be customized for any age and come with a white envelope and Zazzle's 100% satisfaction guarantee. These work well for a Great Gatsby or Downton Abbey theme party for a woman or for any classy birthday party theme you'd like. Retro Birthday Party Invitations - A collection of Retro Style Birthday Party Invitations. Are you looking or a theme for your next holiday party? Why not go glam and make it a 1920's style event? The 1920's represent a time when men and women went a little bit wild. Although it might seem a bit tame compared to today's standards, Flappers and Gents ruled the day back then and drinking champagne and dancing on the tables was a common event at the speakeasy. This fun 1920's Holiday Party Invitation invites your guests to do just that! The front has a black background with white Art Deco lettering. The flip side has a black border surrounding all of your personalized party information. There are many more incredible 1920's holiday invites to choose from. Many of our hand-picked Art Deco 1920's theme style invitations can be customized for any occasion. Are you having a glamorous 1920's Great Gatsby Art Deco theme wedding? You're going to love these custom posters that can be strategically placed around your reception room to help guests find what they need. There are many different color choices and styles to choose from that can be purchased in several different sizes. Here's a small sample of what's available. You can use the "Choose a Seat Not a Side" at the ceremony to let guests know they can sit where ever they like. Shown here as a black and gold Gatsby style print. This is a nice way to greet your guests and let them know they're in the right place and that you're glad they came. The featured one here is a beautiful vintage style in blush. There are all kinds of retro 1920's style wedding signs available that say pretty much anything you might need such as Photo Booth signs, a sign requesting guests to sign your guest book, a print that lets your friends and family know where to place their gifts and more. Click on your favorites to learn more. Please keep in mind that the size of the print you choose will determine your cost. Each print is available in many different sizes to suit your needs. And, ironically, there's even a vintage Gatsby style wedding Hashtag sign that you can personalize and use to let everyone know which hashtag to use when posting your wedding photos on social media. And Help Us Share The Love! At the end of the celebration you can use this sign (or one like it) placed at the exit to let your friends and family know how much you appreciate them and their time spent with you at your vintage wedding. This one is a beautiful blue and gold color scheme done in the roaring twenties art deco design style. And we'd like to take this time to thank you for visiting our page and we do hope you found something you'd like to use at your retro wedding. We showcased 10 vintage style wedding signs that would be fun and useful at a retro glamorous wedding reception but there's tons more to see. There are even templates there that will allow you to add your own text to create your own vintage looking signs for your wedding or any other occasion. Visit Retro Vintage Wedding Signs and Posters to see the entire selection and to learn more about sizes and pricing. Are you planning on being a summer bride? Do you LOVE art deco style invitations? If your answers to those questions were yes and YES, then you need to see this glamorous vintage beach wedding invitation and matching stationery collection. The design features a beautiful formally-dressed 1920's couple overlooking a dance floor from a balcony at the beach with Palm trees on each side and a glowing full moon in the middle. This romantic image is framed by a blush toned Art Deco block design. Here's a few of the gorgeous stationery pieces from the collection. This stunning design would work perfectly for a summer or beach themed wedding. It would also be ideal for a destination wedding being held somewhere,anywhere, that's warm and sandy. Visit ﻿Art Deco Vintage Beach Wedding Invitations﻿ to see more of the pieces as well as some other designs. There's even another variation of this one that you might love. Don't miss our other retro wedding invitations. I don't know about you but I can't face the day without a cup of coffee. Okay, make that more than one cup of coffee and when I need a pick me up in the middle of the day, make mine an espresso. 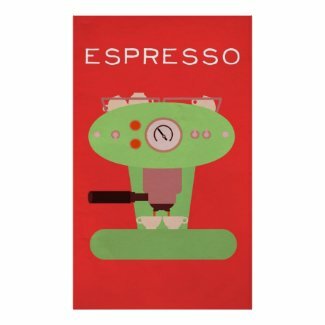 That's why I fell in love with these super cute retro style Espresso posters that I found at Zazzle.com. The first two shown above are vintage images from long ago. As with all of the posters at Zazzle, you can order them in a multitude of different sizes and they are available framed or unframed. The quality is backed by Zazzle's 100% satisfaction guarantee and I think you'll agree they'd look great in your home, office, or even your restaurant or coffee bar. ​If you're looking for something a little more "modern" then you might like one of the following retro designs. Adorable, right? I'm especially loving that quirky green espresso machine print. And there's a lot more amazing poster art prints to choose from. ​These make great gifts for anyone who can't live without their coffee! Click here to visit Espresso Posters to see them all! I just came across these adorable Save the Date Cards that would be perfect for your special Roaring Twenties wedding and I had to share them here with you. ​The mint green, black and white design focuses on a vintage style Jazz trumpet. The fun typography lettering is done in chic art deco style. A black border with a unique scroll design finishes off the look. These would be perfect if you're planning a casual vintage Roaring Twenties Speakeasy, a more formal Downton Abbey inspired wedding or even if you and your partner love Jazz music and plan to make that the theme for your most romantic day. These are easy to personalize, come with a white envelope and you can order as many or as few as you need. I think they're the perfect way to "trumpet" the news of your upcoming nuptials to your friends and family. Retro Invites is an affiliate site (full disclosure) that's owned and written by a small team of two writers named Bonnie and Robin. ​Former co-workers who became friends based on their love of 80's music, pop culture, and everything retro and vintage. Both have been freelance writers for many more years than they care to divulge. Visit Retro Robin's Etsy shop, Imperial Crochet. Our invites and gifts are modern made reproductions, not actual antiques. ​The invitations come with a standard envelope and a 100% satisfaction guarantee from the manufacturer, Zazzle. Learn more by visiting our About page. Please note: This page and all of the pages on Retro Invites generate income based on an affiliate relationship with our partners including Zazzle, Amazon and others. Read our Affiliate Disclosure HERE.